The Alachua County Tax Collector is an agent for the Florida Department of Highway Safety and Motor Vehicles. Florida residents from any County may receive driver license and motor vehicle services at each of our locations. However, road tests are conducted at our Northwest office only. Drivers may also be eligible to renew or replace a driver license online at GoRenew.com. For these services, you can get a list of providers from the Florida Highway Safety and Motor Vehicles website. Before you visit our office for any driver license transaction, you may click here to check the status of your license online. Due to privacy laws, we do not provide driver license status information by phone. 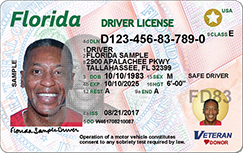 In August 2017, the Florida Department of Highway Safety and Motor Vehicles began issuing a new, more secure Florida driver license and ID card. Previous driver license and ID cards will still be in use alongside the new license until replaced or phased out. The following services are provided at our Southwest and Downtown Branches, excluding road tests. All road tests are administered at our Northwest Branch, by appointment only. Please note that the Alachua County Tax Collector does not provide CDL Road Skills Testing. A list of certified CDL skills testing sites is available HERE. Full Driver License services are provided at the Northwest Branch, located at 5801 NW 34th Blvd, Gainesville FL, 32653. The following are tests conducted at the Alachua County Tax Collector’s office. All tests may or may not be required for the type of driver license or ID card you seek. Hearing – Drivers applying for a license who are deaf or cannot hear conversation spoken in a normal tone of voice, are restricted to driving with an outside rearview mirror which should be mounted on the left side of the vehicle, or wearing of a hearing aid. Vision – Vision testing, using an eye machine located on the counter, is conducted in all driver license service centers. Individuals with visual acuity readings below 20/40 are referred to an eye specialist. Color blindness will not cause any special condition for licensing. Knowledge Exam – This test is conducted by appointment only. To make an appointment Click Here. This test consists of 50 multiple choice questions about traffic laws and traffic signs. To prepare, review the Florida Driver License Handbook and take the online practice test. For interpreted tests please call (352) 374-5236 to schedule an appointment. Interpreted tests are only administered on Tuesdays, Wednesdays, and Thursdays between the hours of 9:00am to 11:00am. Driving/Road Test – This test is conducted by appointment only at our Northwest Branch located at 5801 NW 34th Blvd. Gainesville, FL 32653. To make an appointment Click Here. For a medical driving test please call (352) 374-5236 to schedule an appointment. You must provide a vehicle for the driving test. The vehicle must have a valid tag, proof of insurance and pass a vehicle inspection. During the driving test, the examiner will observe your ability to control the vehicle and how well you obey traffic laws. The Alachua County Tax Collector’s office does NOT provide CDL road skills testing. For a list of certified CDL skills testings sites Click Here. The Federal REAL ID Act became effective nationwide on May 11, 2008. Florida began issuing REAL ID compliant credentials after January 1, 2010. Because Florida is a REAL ID compliant state, Florida driver licenses and ID cards are accepted nationwide as official identification for domestic air travel and access to military bases and most Federal facilities. The new credentials have a star in the upper right corner of the card, as shown in the sample license example below. 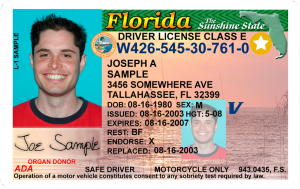 Because Florida is a REAL ID compliant state, all Florida licenses should be accepted nationwide. The Department of Homeland Security announced on December 20, 2013, that enforcement of REAL ID credentials will begin in a measured, fair and responsible way. Floridians will first see enforcement at nuclear power plants and restricted areas of certain federal facilities. Enforcement at airports across the country will not begin until October 1, 2020. In order to become Real ID Compliant (if you do not have the star) you will need to bring the proper documentation to establish your identity, proof of legal residence and date of birth. For a detailed list of required items, see below. To establish a Florida driver’s license or ID card and become Real ID compliant, Florida law requires proof of identity, Social Security number, and 2 proofs of residential address. To create a personalized checklist of the documents you need to bring, visit What to Bring. Has your name ever changed? If you are presenting a US birth certificate using a name other than your current name (if you are divorced or married), you are required to present an original or certified copy of your marriage license showing how you obtained your current name. Example: If your birth certificate reads “Mary Alice Doe DOB: 03/06/1970” and your Florida Driver License reads “Mary Alice Smith”, we will need an original or certified copy of your marriage license to show how the name changed from Doe to Smith. Florida marriage licenses generally have the maiden name on the marriage license. If you have been married more than once and the maiden name appears on the document which connects you to your current name, that is acceptable. If the document you are using for your current last name does not have your maiden name listed, you must present a document trail that links your current name to your primary document. This only applies to US birth certificates. An original or certified copy of your marriage license is not required if you are presenting a US passport in your current name. Born in Florida and need a copy of your birth certificate? Click here for information on obtaining your Florida Birth certificate. If your I-94 is electronic, please print it out at the following website: www.cbp.gov/i94 and bring it with you. In order for your Florida license to reflect your new name, you must have your name changed on your USCIS documents (i.e. Passport or I-551 Permanent Resident Card). You must also provide a certified proof of name change document (i.e. marriage certificate). In order for your Florida license to reflect your new name, you must have your name changed on your Canadian Citizenship document. A certified proof of name change document (i.e. marriage certificate) must also be provided. Self Certification (Self Certification Form is Available Here) – Please note that the social security number must verify through the Social Security Administration system. U.S. citizens and permanent residents must present form L-676 from the Social Security Administration. In addition, U.S. citizens, permanent residents and Canadian citizens without a social security number, as well as those with temporary status classifications from DHS, and must bring at least one proof of secondary ID from the list available at What to Bring..
No proof of residential address? If you have no proof of residential address, you can bring in one proof of address in the name of the person you are living with and complete the Certification of Address Statement. The Certification of Address Statement form can be found HERE. Customers must renew their Florida driver license or ID card every eight years. The expiration date is listed on the credential. Florida driver license and ID card holders may renew their credential up to 18 months in advance of the expiration date. Drivers can replace their driver license or ID card prior to its expiration if the credential is lost, stolen or they need to make an update. If there is a change of address, Florida driver license or ID card holders have 30 days to update their address on the credential. If there is a name change, Florida driver license or ID card holders must update their name with the Social Security Administration prior to updating their name on the credential and they must present an original or certified court order of marriage certificate when applying to change the name on their driver license or ID card. If a driver license or ID card is lost or stolen. If a customer wishes to add or update a designation or other information listed on the credential. DHSMV offers a quick, convenient way to renew your driver license or ID card online at GoRenew.com. To renew or replace a credential online, the department must verify a customer’s Social Security number. If the department is unable to verify, the customer must follow up with the Social Security Administration. Renew a driver license online: Florida offers a one-time online convenience renewal for customers. Visit GoRenew.com to see if you are eligible. Customers who are NOT Real ID compliant and wish to become Real ID compliant (look for the gold star on the driver license or ID card) must visit one of our service center locations and produce their required documentation. Click here for a list of required documents to become Real ID compliant. Update the address on your driver license or ID card online. Replace a lost or stolen credential online (no changes). Customers using GoRenew.com will receive their credential in the mail within 7-10 business days from the transaction. A $2.00 processing fee is assessed to the total transaction. Customers can receive an emailed confirmation receipt of the transaction. On the payment confirmation page customers must select ‘yes’, enter an email address, and click ‘Send Email Conformation’ for the information to be emailed. Customers may visit any of our service center locations to renew, replace, or update their driver license or ID card. Please come prepared to present your required documents. To make an appointment click here. If a customer has already used their one-time online convenience renewal. If a customer wishes to become Real ID compliant. If a customer wishes to update their photo. If the customer is changing their name using an original or certified court order or marriage certificate. If a customer wishes to add or remove a designation, or has a court order to update their credential. If a customer is getting a Florida driver license or ID card for the first time. If the customer holds a commercial driver license. If the license has the word “TEMPORARY” printed on it. What to bring if I AM Real ID compliant? Renew a driver license or ID card in office (no changes): If you do not require any changes to your information and you ARE Real ID compliant, to renew in-person present your proof of identification such as your Florida Driver License or ID card. Update photo in office: To update your photo you must provide your proof of identification such as your Florida Driver License or ID card. Update name/name change in office: If your name has changed due to marriage, divorce, or personal reasons, you will need to update your name with the Social Security Administration before updating your driver’s license or ID card. In order to change your name on your driver license or ID card you may provide your US Passport reflecting your new name OR your Social Security card reflecting your new name along with your certified name change documents such as a court order, marriage certificate, or divorce decree. What to bring if I am NOT Real ID compliant? Renew, Replace or Update a driver license or ID card in office: Customers who are NOT Real ID compliant must visit one of our service center locations and produce their required documentation. Click here for a list of required documents. Must provide documents needed to establish proof of identity, proof of social security number and proof of residential address. Click Here for a list of acceptable documents. Must provide documents needed to establish proof of identity, proof of Social Security number and proof of residential address if you have not previously provided these documents. Click Here for a list of acceptable documents. If you are upgrading from a learner’s permit to an operator’s license, you must bring your learner’s permit to our office to upgrade. If you do not have your learner’s permit, you will be required to pay $31.25 for the upgrade. These laws allow teen drivers to safely gain driving experience under lower-risk conditions before obtaining full driving privileges. These laws outline limits and restrictions for new drivers ages 15 through 17. Florida’s GDL laws are designed to help teens gradually and safely build their skills and experience behind the wheel. It is important for teens and their parents to understand these laws and obey them. Learner’s License: Daylight hours for first three months after license issued – until 10 p.m. after three months. Driver’s License (16 years old): NOT between 11pm to 6am. Unless driving to or from work OR accompanied by a licensed driver 21+. Driver’s License (17 years old): NOT between 1am to 5am. Unless driving to or from work OR accompanied by a licensed driver 21+. There are several reasons why a driver license might be suspended or revoked and, depending on the circumstances, varying requirements for reinstatement. For detailed information about reinstating a driver license after being suspended or revoked due to unpaid traffic tickets, failure to comply or appear at a traffic summons, failure to complete a court-ordered driver improvement course, inadequate vision, being a habitual traffic offender, being delinquent in child support and more, click here for the Florida Department of Highway Safety and Motor Vehicles website. Written tests are conducted by appointment only. Please click HERE to make an appointment. Interpreted tests are administered on Tuesday, Wednesday and Thursday between the hours of 9:00am -11:00am by appointment only. To make an appointment please Call our Call Center at (352) 374-5236. Please note that the Alachua County Tax Collector does not provide CDL Road Skills Testing. A list of certified CDL skills testing sites is available HERE. Road tests are conducted by appointment only at our Northwest Branch located at 5801 NW 34th Blvd, Gainesville FL, 32653. You must bring in current proof of registration and insurance on the vehicle you will take the test in or the test cannot be administered. *For a MEDICAL road test you must call to schedule an appointment at (352) 374-5236. For a non-medical road test please click HERE to make an appointment. * CDL drivers who are applying for or work for a public or non-public school must present a letter from their employer or their school employment identification card to receive the CDL at the fee listed above. 1. Where can I get the latest information on the requirements to obtain a Florida driver license or identification card? Answer: The website GatherGoGet.com has all the information to assist you in making a checklist of the required documents. All documents must be the original government-issued item; no copies will be accepted. 2. What do I need to exchange my driver license or identification card from another state to Florida? An original Social Security card or acceptable proof of Social Security number. Social Security records must match the name being used and must include customer’s full Social Security number to be accepted. Handwritten documents are not accepted. Contact the Social Security Administration at least 48-72 hours before making application for a driver license or identification card when changing names. NOTE: Applicants under age 18 must have signed parental consent. You must surrender all Florida and out-of-state driver licenses or ID cards. 3. How will I prove my identity under the Real ID requirements? Answer: All customers must bring in the following documents to prove their identity and receive their licenses or IDs. Note: original or certified name change documents for all (marriage, divorce, adoption, legal name change, etc.) must be presented at the time of application (may require more than one and must show a continuous link from birth name to current legal name); church marriage documents are not acceptable. 4. I just turned 21. What do I need to do to get the "over 21" horizontal license? Answer: If you are REAL ID compliant, meaning your license has a gold star toward the top right of the front of the license, you are only required to bring the current license in the office. If there is a change to your REAL ID compliant license, such as address change, you will need to bring in proof of the requested change. If you are not REAL ID compliant, you will need to bring the standard REAL ID required documents to prove legal residence. These documents are outlined HERE. The cost for updating your license is $31.25. 5. I changed my address online after receiving a Real ID compliant card. Will I have to present proof of address during my next office visit? Answer: Yes. You will be required to present two proofs of your new address. 6. How do I get the VETERAN designation on my Florida License or Identification Card? Answer: Florida veterans who honorably served their Country can now add a veteran designation to their driver license or identification card. You will need to present your DD-214, which shows the honorable discharge from active duty. A Retired Military ID Card or a Veteran’s Affairs ID Card can be used in place of the DD-214. For original issuance and renewals the designation is added for free. For replacement issuance when there are no changes to the card other than adding the veteran designation, there is no fee. For a replacement with changes to the card in addition to the designation you will pay $25.00 for the replacement. Go to www.GatherGoGet.com to ensure you have all the other required documents. Veterans who need to obtain a copy of their DD-214 may request it through the National Archives, which provides information on how to make the request online HERE. 7. Which tax collector offices offer driver license and identification card services? The Tax Collector offers all driver license services at the Northwest Public Branch location. The Southwest and Downtown branches offer all services except for CDL Hazardous Materials Applications and Class E Road Tests. 8. Why have the license and ID card requirements changed? Answer: Florida has passed laws that will help better protect our citizens and visitors by strengthening our ability to verify an applicant’s identity and legal presence in the United States. The changes will help increase our overall security. 9. Where can I find additional information on the Real ID requirements? 10. I only have copies of my documents, not originals. What should I do? Answer: You will need to request certified documents. For example, a replacement Social Security card is free, while a certified Florida birth certificate processed in the Tax Collector’s office is $21.25. If you need help determining how to get replacement documents, visit www.GatherGoGet.com and click on “Document Help” or call our Customer Service Line at (352) 374-5236. 11. Can I still get both a driver license and an identification card? Answer: Unfortunately, no. Florida law requires the surrender of all licenses and identification cards in your possession to be issued a new driver license or identification card. 12. Does the Real ID Act require me to purchase a new driver license or identification card immediately? However, if you must visit an office to update or make any changes to your license, you will be required to comply with the Real ID requirements. For instance, if you have used the one-time convenience renewal option, your next renewal must be in an office. Name changes, name corrections, and date of birth corrections will require a visit to an office. 13. What tests are required to obtain a Florida learner’s license? Must meet all the requirements of the Real ID Act. Pass the vision exam and Class E General Knowledge (50 questions) tests. Have the signature of one parent (or guardian) on the parental consent form, if under age 18. Complete Traffic Law and Substance Abuse Education course (TLSAE, DATE, or TL-DOE). Must be in compliance with school attendance requirements if under age 18. Parent accompanying the applicant to the office can provide two proofs of their Florida residential address from two different sources (addresses must be identical) and verbally certify the applicant lives with them. Otherwise a Certification of Address(Form HSMV 7120) is available online HERE. 14. My driver license is expired; will I need to take any tests to renew? Answer: All in-office renewals require a vision exam and are subject to all of the identification requirements of the Real ID Act. 15. I am 18 years old and applying for my first driver license. What do I need to do? First time drivers must have completed a state-approved Traffic Law Substance Abuse Education course. Pass the Vision and Class E General Knowledge (50 questions) tests to obtain a learner’s license. Applicants also passing the road skills exam can be issued a regular operator’s license without delay. First time applicants also must meet all the identification requirements of the Real ID Act. 16. Can I take the written exam online? Answer: Applicants under age 18 may take the written exam online. A parent must be present to proctor the exam and accompany the applicant to the office to sign an affidavit. Falsification of parental proctoring will result in license suspensions for the parent and applicant. 17. Is it better or cheaper to take the written exam online? Answer: While we gladly accept online testing results, parents should investigate the fees associated with online testing. The original Florida licensing fee includes one attempt at the required exam. 18. I lost my license/ID card. Will I have to get one of these new licenses/IDs? Answer: Not necessarily. You can request a replacement license at www.gorenew.com. In most cases you may replace online one time, but DHSMV encourages you to come in and obtain a Real ID compliant license. At this time starting October 1, 2020, the Transportation Security Administration (TSA) will only accept drivers licenses and ID cards with a star (Real ID compliant designation) in the upper right corner as proof of identification at airport. 19. My last name is different than what is on my primary identification document, What should I do? Answer: We need to see proof of your name change. If your name has changed multiple times, you must present a document trail that links your current name to your primary identification document. If your name has changed due to marriage or a court order, you must submit the original or a certified copy of your marriage certificate(s) or court order(s). Church certificates are not acceptable. For example, let’s say the last name on your birth certificate is Brown. You got married and changed your name to Smith. You got divorced, remarried, and your name changed to Johnson. You must provide a marriage certificate showing your name change from Brown to Smith, and you must also show a marriage certificate of your name change from Smith to Johnson. If your marriage certificate showing your name change to Johnson has your maiden name Brown listed on it, you will not need to bring in any previous marriage licenses. If you bring in a valid US passport in your current name, we do not need a birth certificate or any marriage licenses. 20. I have lost my Social Security card. How can I get a new one? Answer: Complete an application for a new card and mail or show it and your identification documents to a Social Security Administration office. The application and list of acceptable forms of identification are available at the Social Security Administration Web Site: www.ssa.gov. The Social Security office is located at 4562 NW 13th Street, Gainesville FL, 32609 (1-877-219-8323). 21. How do I change my name on my Florida license or identification card? Answer: If you have legally changed your name by marriage or court order, you must submit the original or a certified copy of your marriage certificate or court order. If your name has changed several times, you will be required to provide a document trail that links your current name to the identification documents provided. If your marriage license with your current name has your maiden name listed on it, then we do not need to see any previous marriage licenses. No photocopies will be accepted unless certified by the issuing authority. Church certificates are not acceptable. A valid US passport with your new name may be used to update your license. Please allow 48-72 hours to pass after you changed your name with the Social Security Administration before you come into our office to change your name on your license or ID card. If you are not a US citizen, you must have your name changed on your USCIS documents (i.e. Permanent Resident card, Foreign Passport, etc) as well prior to coming in to change your license. 22. How long do I have to change my name or address on my driver license or identification card? Answer: Thirty (30) days. Name Changes must be made in an office, and you must comply with the Real ID Requirements. If you change your address in an office, you must comply with the Real ID requirements. You will be required to show two proofs of residential address to update your address on your license or identification card. If you have a Real ID compliant card and change your address online, you will be required to present two proofs of your new address during the next office visit. 23. Can my child be issued a Florida identification card? Answer: Children five years of age and older can obtain a Florida identification card. Children under five years of age applying for a disabled parking permit also may be issued a Florida identification card. Please be prepared to meet the Real ID requirements and present the handicap placard application signed by a doctor. Beginning November 1, 2009, no driver license or ID card will be required to obtain a handicap placard. 24. I received a traffic citation. How can I keep the points off of my Florida license? Answer: Contact the Clerk of Court in the county the citation was received in and arrange to attend the driving school prior to paying the citation. CDL drivers cannot attend driving school to avoid points on their license. 25. My driver license may be suspended. How can I find out without visiting an office? Answer: You can check the status of your driver license online at www.flhsmv.gov. 26. I’m in the military stationed outside of Florida and my license/ID card was stolen/lost/destroyed. How do I get it replaced? Answer: You can apply for a replacement online if your citizenship has been established on your driving record. Military personnel whose driver license or ID card have been lost or stolen may receive a replacement license through the mail, or a 90-day temporary permit will be mailed to you along with duplicate license instructions. Please contact DHSMV’s Customer Service Center at (850) 617-2000. 27. I’m in the military stationed outside of Florida and my license/ID card is about to expire. How do I request an extension? Answer: If your driver’s license or ID card is scheduled to expire when you are deployed or stationed outside Florida, you are encouraged to renew before you deploy or move. Florida drivers may renew a drivers license up to 18 months prior to the expiration and an ID card holder may renew up to 12 months prior to the expiration date printed on the card. Military personnel and members of their immediate family residing with them (spouse, son, daughter, and step-children) may be granted an extension of their Class E license. The military extension card is free of charge, and will be a photo ID that you carry with your Florida license and Military ID. Click here to download an application. A Commercial Driver License may not be extended. A CDL must be renewed in person. 28. How do I apply for a commercial driver license (CDL)? Answer: Customers applying for a CDL should consider this a professional license that will require additional testing far beyond that of a regular license. Customers wishing to apply for a CDL are strongly encouraged to obtain a CDL handbook prior to setting appointments for testing. Click the link HERE to download a copy of the CDL handbook. All CDL applicants must also pass the CDL pre-trip, basic skills, and driving exams in a commercial motor vehicle of the proper license class. *These are examples of the testing requirements and may vary depending on the vehicle driven and loads carried. Refer to the CDL handbook for additional testing requirements. NOTE: Requirements for Real ID apply to all CDL applicants. 29. What are the residency requirements for a commercial driver license (CDL)? Answer: Federal regulations require drivers to obtain a CDL license in their home state. This includes members of the armed forces. Proof of Florida residency will be required for all original applications. 30. I am a member of the armed forces and a Florida resident. How can I obtain a commercial driver license (CDL)? Answer: Military members with a military equivalent CDL must pass all required written exams for the license class for which they are applying. Once the written exams are passed, the applicant can use a driving skills waiver signed by his/her military command to waive the driving exams. 31. Does Florida require a valid medical card for CDL licensed drivers? Federal Motor Carrier Safety Regulations require all commercial driver license holders to certify with the State’s driver license agency in one of the four categories below prior to the issuance or renewal of a CDL. Those certifying in non-excepted interstate or intrastate commerce (Category 1 or 3) also must ensure their medical documentation is on file with the state issuing agency and that it remains current. Failure to present valid medical documentation when required will result in the denial of the issuance or renewal of the CDL. Failure to maintain current medical documentation on file may result in CDL disqualification. 1. Non-excepted Interstate: I operate or expect to operate in interstate commerce and am required to maintain federal medical certification (medical card required). 2. Excepted Interstate: I operate or expect to operate in interstate commerce but engage exclusively in operations that qualify me for exception from the requirement to maintain federal medical certification. 3. Non-excepted Intrastate: I operate or expect to operate only in intrastate commerce and am required to meet State of Florida medical certification requirements (medical card required). 4. Excepted Intrastate: I operate or expect to operate only in intrastate commerce but engage exclusively in operations that qualify me for exception from State of Florida medical certification requirements. CDL holders can no longer claim exemption from medical certification requirements because they are not currently operating in non-excepted interstate or intrastate commerce. If not specifically included in Category 2 or 4 above, they must maintain their medical certification or downgrade to a non-commercial license. Note: If you self-certify in a category exempt from medical certification requirements (Category 2 or 4) and later change to a non-exempt type of operation (Category 1 or 3), you must recertify in the appropriate category and provide proof of valid medical certification to avoid potential enforcement actions. For additional information and frequently asked questions concerning medical requirements, visit www.flhsmv.gov/ddl/cdlmedicalcert.html. 32. I received a citation. How can I verify if I can attend a driver school to avoid points? Answer: You can verify your driver school eligibility online at www.flhsmv.gov by using the online driver license check. 33. I have updated my Social Security information. How can I verify it now matches? Answer: You can verify your Social Security information online at www.flhsmv.gov by using the online driver license check. 34. I received a letter asking for insurance information for my driver license. How do I update my insurance information? When insurance information is requested by Tallahassee for your driver record, you can update the records online at www.flhsmv.gov by using the online driver license check. 35. How do I obtain a driver handbook for Florida? Answer: Handbooks are available HERE on the Department of Highway Safety and Motor Vehicles website. 36. I have passed the written commercial driver license exams. How do I contact a third party tester for the driving exams? Answer: The Department of Highway Safety and Motor Vehicles’ authorized third party testers are listed online HERE. 37. I have been fingerprinted for my hazardous materials endorsement. How can I check the status of my background check? Answer: You can verify the status of your background check online HERE. 38. How do I renew my Florida CDL with a hazardous materials endorsement? Answer: In addition to all other CDL requirements, you must pass the hazardous materials written exam, submit a background check application, and be fingerprinted. 39. I have a Florida CDL with a hazardous materials endorsement. Will I still be allowed to carry hazardous materials while my renewal application is being processed? Answer: Drivers renewing with at least one day left on their current CDL will receive a 90-day permit for hazardous materials. Once your background check is approved by the Transportation Security Administration (TSA), you will receive by mail a new CDL with the “H” endorsement. 40. I am applying for a hazardous materials endorsement on my Florida CDL. When will I be able to haul hazardous materials? Answer: The background check and fingerprint application can take up to 90 days to complete. You will not be authorized to haul hazardous materials until your background check and fingerprint application have been approved by the Transportation Security Administration (TSA) and the new license with the “H” endorsement is in your possession. 41. For how long is a Florida CDL with hazardous materials endorsement valid? Answer: A Florida CDL with hazardous materials endorsement is valid for four year. 42. I have a Florida CDL that is valid for eight years. How will adding a hazardous materials endorsement affect my current license? Answer: Your replacement license with the hazardous materials endorsement will expire in four years. 43. I have to renew my Florida CDL in 15 months. If I add the hazardous materials endorsement now, will I have to pass the written test and background check again when I renew? Answer: Yes. The hazardous materials written exam, background check, and fingerprint application are required during every renewal. 44. How far in advance can I renew my Florida CDL with hazardous materials endorsement? Answer: CDL drivers with a hazardous materials endorsement may renew up to 12 months in advance. To avoid possible loss of eligibility to haul hazardous materials while waiting for the Transportation Security Administration (TSA) to approve your background check, you are encouraged to make your application at least 30 days prior to expiration of your license. 45. What courses are approved for driver improvement or DUI?